Now there is this Suitcase Scale With Measuring Tape that will make you travel less stressful as you now will know what your suitcase weighs and how it is. This portable digital luggage scale is made to be part of your travel kit as it is compact and offers everything you need. The scale is digital and can tell you pounds of KG’s and simply uses a small strong strap that goes around the handle of your bag and then you lift it to see the weight. And if you wonder if your luggage is small enough to be carry on then you are in luck as there is a measuring tape build in the scale so that you can measure exactly what size it is. We all know travel scales and often these luggage scales run out of power or are just big and bulky but now there is a solution. Now there is a kinetic power travel scale that you just shake for 10 seconds and it will have enough power to weigh you suitcase at home and on you trip. They even build in the weigh strap so that the travel luggage scale is compact and easy to take with you on the trip and the means you don’t have to worry about you suitcases being to heavy. Taylor is gone make weighing you bags a lot easier with this luggage scale. The scale has foldable handles that makes it easier to lift the bag. Just click the strap around a bag handle and lift it with two hands then when you hear a beep just put the bag down and read the weight on the display or listen to the voice that tells it to you. No more over weight bags when you have this scale with you when you travel. This luggage scale from Taylor can measure weights up to 88 pounds. A luggage scale like this will be your favorite travel companion before you know it. No more paying for over weight luggage because this travel scale is gone tell you before you leave for the airport if you bags are within the limits. The EZ tavel scale II is slide under your suitcase handle and then you lift it and in you hand the display will tell you the weight of the bag in pounds or kilo’s. 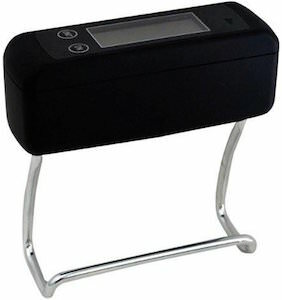 The luggage scale can weigh bags up to 100 lb or 45 kg. And everything you need is included a storage pouch and yes even the batteries are there so that you can use it as soon as it arrives. It’s always handy to know if you luggage is overweight or not because if it is then that could become really expensive if you find out at the airport. 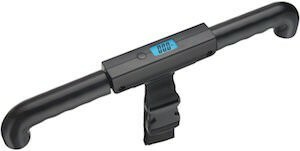 And now there is this simple and easy to use luggage scale that does not need batteries and can tell you quick and accurately how much you bag weighs. The special mechanism makes it easy for you to weight the bag because the dial stays at the weight so that you can see if after you put the bag down again. And this luggage scale can weigh up to 75 pounds and also tells you the weight in KG’s. Are you worried that you suitcase weight is to high? If that happens to you often then a portable luggage scale would be perfect for you. This scale is easy to use just clip it on your bag and hold it in the air and you will know how much your luggage weighs and then you have the answer and know if you have to repack that suitcase. 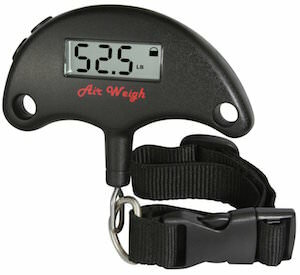 The Air Weigh can measure between 0.2 lb and 75 pounds and can also display the weight in KG’s. 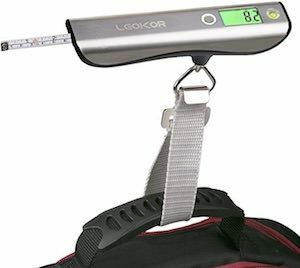 Just tuck this handy portable luggage scale in your suitcase so that you also know on the way back home if you suitcase is within it’s limits.